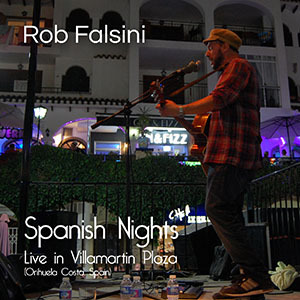 Recorded live at Villamartin Plaza in August 2017, singer-songwriter Rob Falsini (robcoventgarden) performs 15 acoustic songs from our centre stage. Including classic covers and some of the best of his own material. You can enjoy the music and memories from an amazing night with Rob in the Orihuela Costa’s best live music venue, the Villamartin Plaza. Spanish Nights is the perfect gift for music fans for Christmas 2017! Order your copy today for only € 9.95 includes P&P!